West Midland Safari Park have been busy preparing for their annual Easter event, and the animals have been getting involved in the celebrations too. For this year’s Easter Eggstravaganza, which runs until the 23rd of April, keepers have been tasked with making Easter-themed enrichment for the animals in their care. 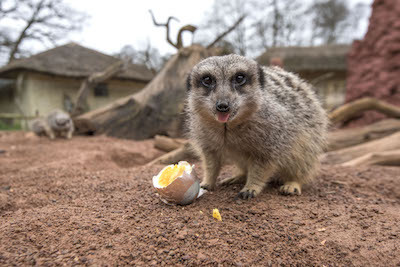 The park’s mob of mischievous meerkats have a well-planned enrichment schedule, which includes ball pits, hessian sacks, shredded snake skin and food hidden in empty ostrich eggs. Enrichment is used to encourage natural behaviours such as foraging, playing and hunting. As an extra special Easter treat, keepers boiled and decorated some chicken eggs, which they then hid around their enclosure. The meerkats had to find the eggs and use their sharp teeth and claws to crack the shells to get at the insides. 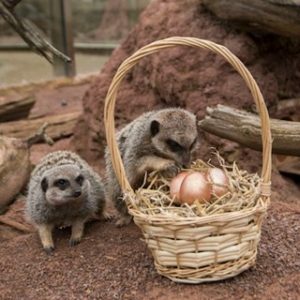 Beth Cheshire, African Village Keeper, said, “Meerkats love eggs so Easter is probably their favourite time of the year. In the wild they will climb up to bird’s nests to steal and eat the eggs, so will go to great lengths to find these treats. As well as the meerkats, the park’s other animals will also receive Easter enrichment, and visitors are encouraged to look out for and spot this on their way round. Easter Eggstravaganza activities are available and included in admission price, with children under the age of three entering free of charge. For further information and tickets visit www.wmsp.co.uk.